RCT Reichelt Chemietechnik presents its new handbook THOMAPLAST® Sealings. The handbook provides a user-friendly overview of the seal assortment of Reichelt Chemietechnik, which allows to find a fast and reliable solution to any seal-specific problems. 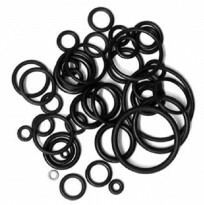 The handbook is divided into the main types of seals (O-rings, clamp seals, flat seals and rings for dairy pipe screw connections) and the products of the individual types of seals are classified according to material. Here, as in the other handbooks of Reichelt Chemietechnik, you will find detailed information on cleaning or sterilization of each product, as well as on the food-safe properties of the respective seal in addition to an extensive material specification including all application-relevant resistance features. All THOMAPLAST® O-rings as well as the other sealing elements in the handbook are available in metric and imperial dimensions. All products from the handbook are also to be found on the homepage of RCT Reichelt Chemietechnik, supplemented by new user-friendly functionalities at the beginning of 2016. Furthermore, the engineers of Reichelt Chemietechnik will be happy to answer any questions you may have on products from this or other handbooks. Please feel free to contact us at any time on +49 (0) 6221-31250.